In this book, well-known physicians, Bocker, Eckardt and Breithardt have put together a succinct and focused book that compliments the CATA Series well. Implantation of defibrillators has evolved dramatically since its introduction by Mirowski in 1980. Technological improvements in devices and leads included a gradual reduction in the size of the device, the introduction of the endocardial approach in 1988, the biphasic waveform and antitachycardia pacing in 1991, pectoral implantation in 1995, inclusion of DDD pacing in 1996 and the delivery of atrial therapies in 1998. 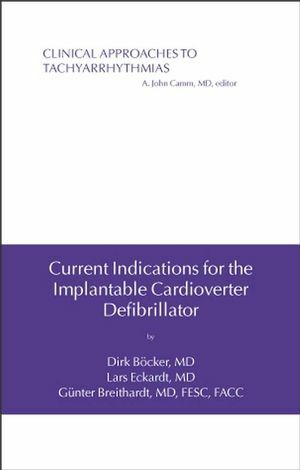 Since the first implantation, a huge body of information on the impact of implantable cardioverter defibrillators (ICD) on prognosis has become available, first as observational studies and later as prospective randomized trials. At the present time, there is a large evidence base from the several ICD trials, although it was not always certain that such a large body of ICD evidence would accumulate. Evolution of guidelines for defibrillator therapy. 5. Background of ICD therapy. 7. Aims of ICD therapy. 7. Clinical efficacy of ICD therapy. 8. Alternatives to ICD therapy. 8. Comparison of drugs and devices. 10. Current indications for ICD therapy. 11. Contraindications to ICD therapy. 11. ICD therapy in specific disease states. 12. Secondary prevention of cardiac arrest or sustained ventricular tachycardias in patients with coronary artery disease. 17. Primary prevention of sudden cardiac death after myocardial infarction. 23. Secondary prevention of cardiac arrest or sustained ventricular tachycardias in nonischemic dilated cardiomyopathy. 26. Primary prevention of sudden cardiac death. 27. Secondary prevention of cardiac arrest in patients with Brugada syndrome. 34. Primary prevention of sudden death in patients with the Brugada ECG pattern. 35. Secondary prevention of cardiac arrest or sustained ventricular tachycardias. 38. Primary prevention of sudden death in HCM... 39. Results of ICD therapy in patients with the long QT syndrome. 46. Arrhythmogenic Right Ventricular Cardiomyopathy (ARVC) 48. Catecholamine- or exercise induced polymorphic ventricular tachycardia. 51. Other patients believed at high risk. 52. Defibrillators as a bridge to heart transplantation. 52. Cardiac Resynchronization Therapy (CRT) 53. Legal implications of defibrillator guidelines. 56.